Lost password or unable to login? (N.B. – Sometimes the password reset system just won’t work, for instance if your registration has accidentally been deleted. etc. Please contact UKWA for assistance). If you need a new password it’s probably best to start at the login page, which is accessed via the main menu (top right-hand side of the website page). The next few steps should be fairly easy to follow using the on-screen instructions, but if you’re struggling it may be helpful to print this page for reference. (Some accounts – particularly Hotmail – seem to reject the system-generated e-mails that allow you to complete this task, so do get in touch with [email protected] if you still need help after reading this). 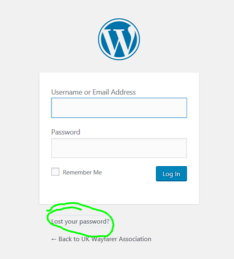 Once you’ve selected “LOG IN” from the main menu, you should see a form with the page the words “Lost your password?” as circled in green (left); this is a link, which you need to follow (click/tap). When you click (or tap) on the “Lost your password?” link you’ll be given the opportunity to enter either your user name or the email address that is associated with your user account. Assuming that you know one of these, type it into the box and then select “RESET PASSWORD”. A brief message should then confirm that a password reset email has been sent to you. Check your Spam folder if you don’t seem to have received the email. When the email arrives in your Inbox there should be a link in the message which you can follow (click/tap) to set up a new password. Follow that link, which will take you to a page (shown left) where you will be able to first enter and then confirm your new password. It can be almost anything, preferably something impossible to guess but easy to remember. Don’t forget to use the “SAVE” button! If everything has worked correctly you will now see a login form. Remember to use your new passsword! To update your email address, for example, simply follow the menu item “My Account“, which is currently located under the “Shop” heading. 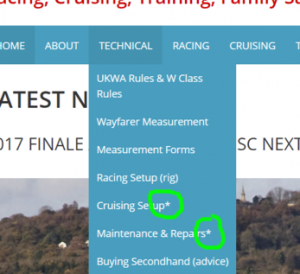 Then you should be able to view and edit most of the settings that relate to your account here on the UKWA website. (Understandably this requires that you first log into the website, so if you have lost or forgotten your password you will need to set up a new one before continuing). Depending on when and how your user account was first set up on this website you may be able to post photos to the forum. If so, when logged in you will be able to see a button labelled “Add Media” at the top left corner of the edit screen when you compose a topic or a reply. Use this rather than the “insert/edit image” button. (If it doesn’t appear and you’re a UKWA member, email the Web Team and we’ll try to sort it out for you). Please edit your photo(s) before uploading, if only to reduce the size to something sensible. The forum pages are only about 835 pixels wide, less on some mobile devices, so there’s no advantage in uploading images wider than that. Save as .jpg (“jpeg”) file format for normal photos, or .png if text is a significant element. The file size limit is currently a generous 5MB. The “Add Media” button will open another screen with two tabs – “Upload Files” and “Media Library”. Usually you will be uploading a new file, so select that tab. From the next screen, choose “select files”, then browse to the relevant location on your device (e.g. Desktop) and select the file, which should then upload in a few seconds over a good connection. 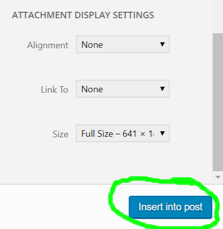 At this stage scroll down on the right side of the screen and you have the option to select how the photo will be aligned (left, right etc), its display size and whether it will form a link (usually “none”), then click “insert into post”. (You can also subsequently edit the alignment, link, display size etc. after uploading, by clicking [tapping a touchscreen] on the image). For some reason adding a caption wrecks the way the image is displayed, so don’t add a caption. Just a brief explanation – content to which access is blocked for non-members is denoted by an asterix (*) next to a menu item.